New Project - A Podcast! I'm having good season at Maitri Farm. Farming with other people is great! We rotate weekend chores. I get to feel like a person! As promised, I've been cooking up a side project my podcast Farmers On Tape. I'm looking for farmers to participate. I'm brand new to producing audio and am excited to be learning new skills. I took a workshop at Union Docs in the Spring and am looking forward to jumping into a new project. I'm looking for farmers to participate in the podcast. I’ll send each participant a microphone that plugs into a smart phone and over several months they will record themselves. Participants will send in their tape every month and have check in calls with me. Then the recordings will be compiled and edited into a 15 – 30 minute audio story. This is inspired by Radio Diaries. More info on how it works. 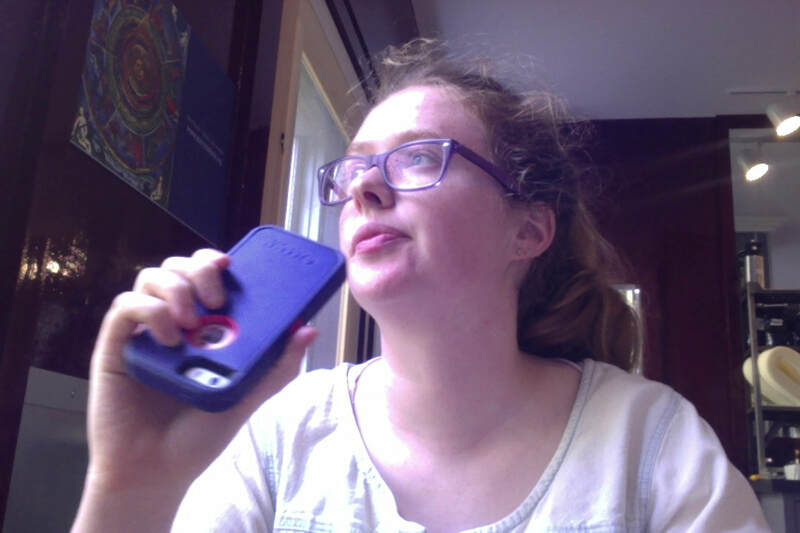 a couple of ramble-y recordings of me talking into my phone about how I feel at the moment. The audience is farmers and non-farmers alike. I want people to learn what it feels like to be a farmer up close. This is not a show about technical skills. I want stories about the humans who grow food telling their stories in their own words. I'm looking for farmers of all types urban, rural, vegetables, livestock, grain, dairy, fruit, conventional, organic and everything in between. We’re looking for participants with different perspectives and experiences from each other. If you know of any farmers that are great talkers and would be game to tell their stories - send them my way. The email address is farmersontape(at)gmail(dot)com. In 2016 about 2/3 of the grazeable acres I was leasing were in an orchard. 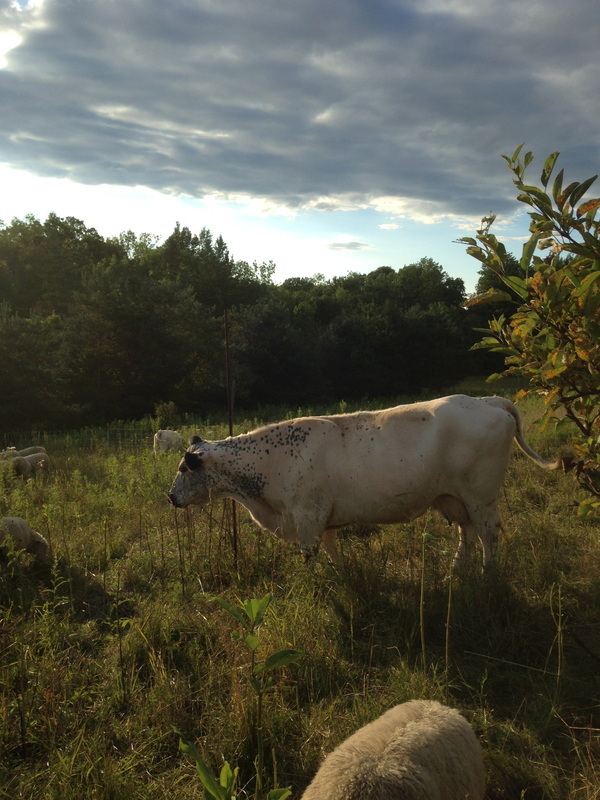 I wasn't exactly sure how different grazing in an orchard would be, but I was excited. This would be an experiment in agroforestry. I loved it. 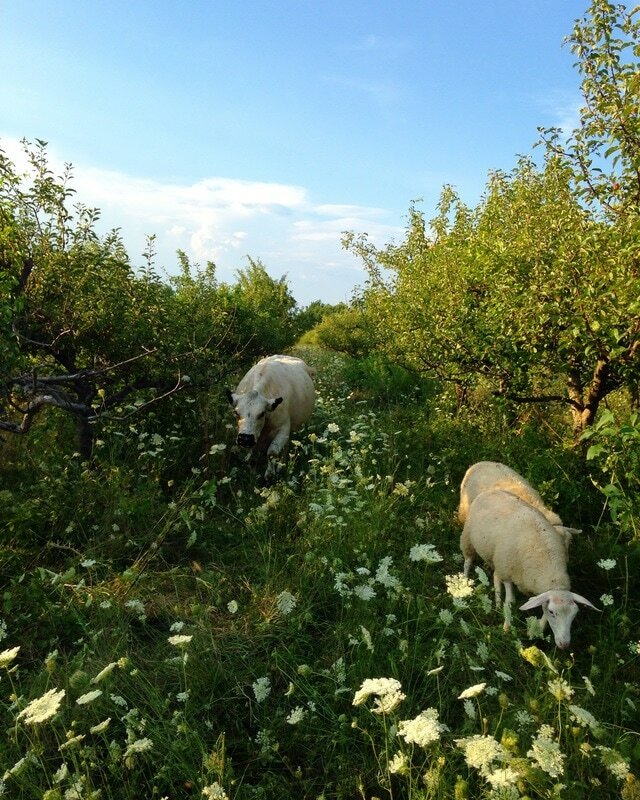 I would graze in an orchard any day of the week for a few reasons. 1. The SHADE in the orchard was the most immediate benefit for the flerd. I was so thankful to have my critters in the shade during July and August. It kept them cooler and less stressed out. Especially with the drought we had last year. 2. Hard cider. I had talked to a cider maker last winter about making hard cider from the apples in the orchard. His crew would have done the harvesting and gotten the apples in exchange for putting Four Legs Farm on the bottle and giving me enough cider to throw a big party on the farm. Unfortunately a late frost killed virtually all of the buds in the orchard and there were not enough apples to bother making cider. This hit a lot of farms in the area really hard. I'm very relieved that my livelihood wasn't riding on this crop of apples. 3. Contract Grazing. Orchards spent money and labor on mowing and applying herbicides. The family whose land I was grazing was very impressed that the sheep had managed to clear the apple tree trunks and keep weeds and brush down. This made me consider contract grazing - providing grazing as a service. This usually involves moving a lot of animals through an area for short duration of time to clear vegetation. There different situations when people would want sheep to perform targeted grazing. This is a game changer. Food has a relatively low price cap that people are willing to pay, but if farming becomes a service the economics are totally different. The ecological engineer in me is getting excited about figuring which metrics would the most relevant for documenting the impacts of targeted grazing. Like how to evaluate the degree to which the sheep have removed underbrush. I'm also fantasizing about showing increases in organic matter in the soil and getting carbon credits as an additional income stream. I'm excited to delve further into figuring out how targeted grazing work. I'll be chewing on this for a while. I received an email asking about why I use electric fencing. This person had seen a pig test the fence and get shocked. They were concerned about it being humane for the pigs. I appreciate that someone took the time to ask me about it instead of jumping to conclusions. Here's my response below. 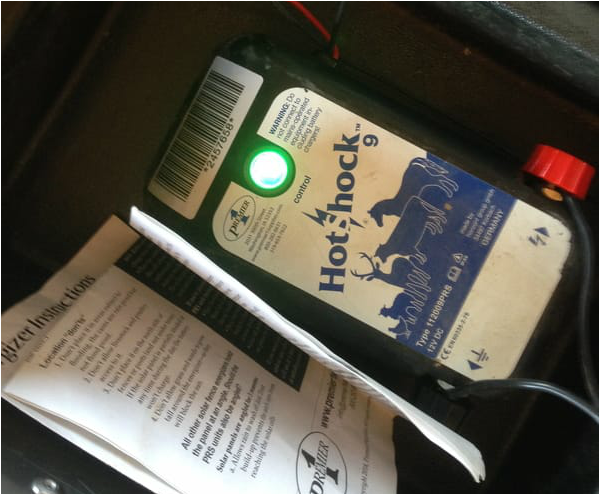 I use electric fencing for many reasons and this is currently considered the best practice for producers raising pigs on pasture. This article explains it well. I have shocked myself accidentally many times. It is certainly startling, but does not cause any injury to the pigs or humans if used properly. Pigs are smart enough to frequently test the fence, as you saw. Electric fence is easy for one person to set up and take down by themselves. This makes it possible for pigs to move to new areas frequently. This allows them to have ground to root in and new vegetation to eat. It also limits the impact the pigs have on one area. If pigs were had to stay in one permanent area they would be compacting the soil and their manure would accumulate in that spot instead of being spread out and acting a fertilizer. I explain more about rotating pigs here. Electric fence makes it possible for me to give them the best life and steward the land to the best of my abilities. Permanent fencing that mimics this arrangement is cost prohibitive for a new farmer. Pigs are smart and strong and need a very sturdy fence that encloses many acres to create a physical barrier. I have moved my farming operations twice and cannot afford to spend thousands on dollars on pig-proof fencing that I can't take with me. I love my animals and work hard to give them the best life possible. I appreciate that you took the time to ask about my practices. Thank you. So You Want to Start a Farm? As someone who has started their own farm and was once responsible for the info account at the National Young Farmers Coalition, I have been asked many times about how to start a farm. Here are some good places to start. 1. Work on other people's farms. It is super helpful see how different farms do things up close, especially when you're just starting out. I worked on more than five different farms before starting my own. Some of them I apprenticed on, some were part-time, some I just worked the farmers' market and for one I got to be very involved in the planning. This helped me figure out what farm enterprises I was excited about and which ones I was not excited about. I also got to see other people's marketing strategies play out. 2. 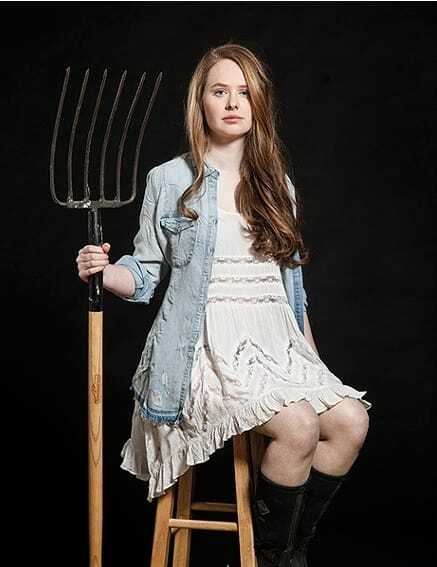 Take a farm business class. I took Farm Beginnings in the Hudson Valley, but this class or similar classes are offered all over the country. It was really helpful for me to focus my farming plans and get specific about what I wanted. 3. Make connections in your community. NYFC has 30 chapters in 26 states and if there isn't one near you - start one! This is a great way meet other young farmers in the area and learn more about what resources are available to you locally. If you're moving to a new place to start a farm make sure you're taking the time to participate your new community - Make friends, go to events. 4. Find Land. A good place to start is looking for local land trusts and farm link programs. Or just start talking to your neighbors if you live in a rural area. Make sure you have a lease - there are a lot of templates available to help you get started. Here's some great resources. 5. Find Money. There aren't really grants out there to help you start a farm, unless there are some local ones that I don't about. (there are grants available for research or certain projects for already established farms). I have used the FSA microloan program and Farm Credit East's Farm Start Program. This is a list of your options. 6. Pace yourself. If you're starting from square one (or even if you're not) it will take a while to get your farm going. Most American farmers work off of the farm in some capacity - it's a lot. Take breaks, drink water and make sure you make time to leave the farm. I continue to be so thankful to be a part of such an amazing community. I am so lucky to get to farm here in the Hudson Valley. ​1. Being featured in the Chronogram's Farm-to-Label spread in March was pretty cool. 2. 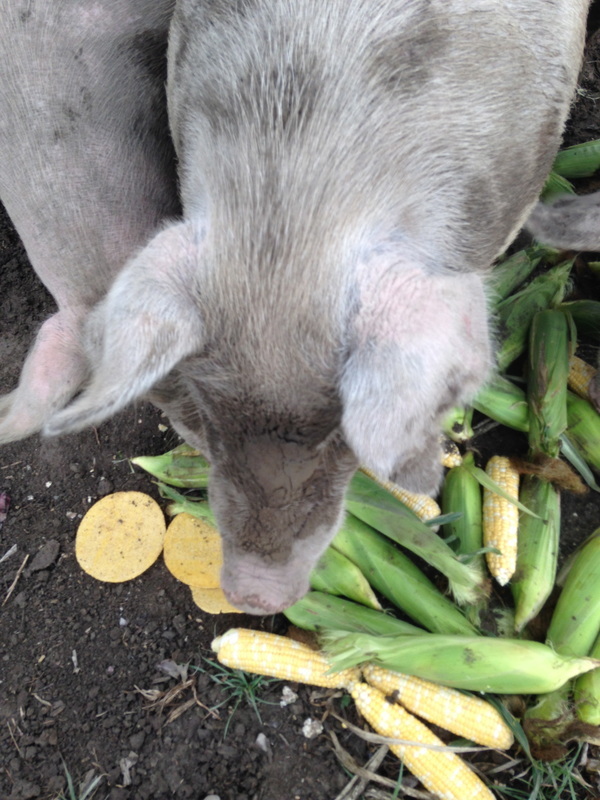 My pigs dug up a lot of crazy debris this year. The most horrifying was a pig who got a bungie cord through it's lip. She was running around with the other end dragging on the ground getting caught on stuff. Pinning the pig down and pulling the bungie cord out of it face gave me a new appreciation for those stories where moms lift cars when their children are trapped underneath them. 3. The BBC interviewed my mom and I about how millenials aren't doing as well as their parents financially. It is way more upbeat than my description lets on. My mom is the best! 4. I sold lamb to Marbled Meat in Cold Spring! This was the first time I sold whole, fresh lambs to a buyer and it's a real game changer. I'm excited to work with them in the future. Thanks for your help transporting the lambs Dad! 5. I bought a truck - 2003 Toyota Tundra. And I replaced the battery all by myself. My mom's response was "But the AAA guy could've been cute!" 6. Seeker (part of the Discovery Channel) filmed me for two days in August and made this video. They took lots of fun shots of the farm with a drone and made me feel like a movie star. 7. I had to put down a calf that wasn't doing well. Holly Rippon-Butler was a super hero and helped me. She grew up on a dairy farm and it was amazing to see someone handle cows with quiet confidence and tenderness. This was one of the hardest things I've had to do while farming. 8. I hosted a Hudson Valley Young Farmers Coalition event. It was an honor to have my community on the farm. The HVYFC organizers did an amazing job putting this event series together. 9. I put on my big girl pants and decided to join Maitri Farm. ​10. I distributed my meat shares. Most of my shares were distributed the week of the election. It felt really important to connect with my community when our whole country is so divided. Thank you all for being a part of this. After careful consideration I have decided to move in a new direction with Four Legs Farm. Maitri Farm in Amenia, NY is buying all of my equipment and inventory and hiring me as their full-time livestock manager. I found that working at my day job at the National Young Farmers Coalition and running the farm by myself was not sustainable for me personally. My farm business was growing and I was finding new opportunities to market my product that held a lot of promise for the future, but I was spreading myself way too thin. Although farming is physically demanding, it was really the anxiety that wore me down. Do the pigs have enough shade? Are coyotes going to go after my lambs? Can I make my next loan payment? Will enough people buy meat shares in time for me to pay my butcher? Can I afford to buy a truck? Can I afford not to buy a truck? Can I make it to the slaughterhouse and back and still get to work on time? I wasn't eating right or sleeping well. Learning new things seemed impossible. Injuring myself from working too hard seemed probable. I felt so alone and there was no reprieve in sight. I could not proceed into 2017 with this arrangement. I needed to find a team. I considered different scenarios for moving forward. Quitting my day job would mean scaling up my farm operations and hiring help. This would mean taking on a lot of debt to finance that expansion (I have already been taking out operating loans to help even out my cashflow). Without having a business partner or a really solid wholesale customer base scaling up rapidly felt foolish. Scaling down my farm operations and keeping my job also did not feel like a viable option because I needed to maintain a certain level of production for my landlords to keep their ag exemptions. My landlords are awesome by the way and I'm happy to talk to anyone interested in leasing that land in Germantown. If it were five or ten years from now maybe the situation would be different. 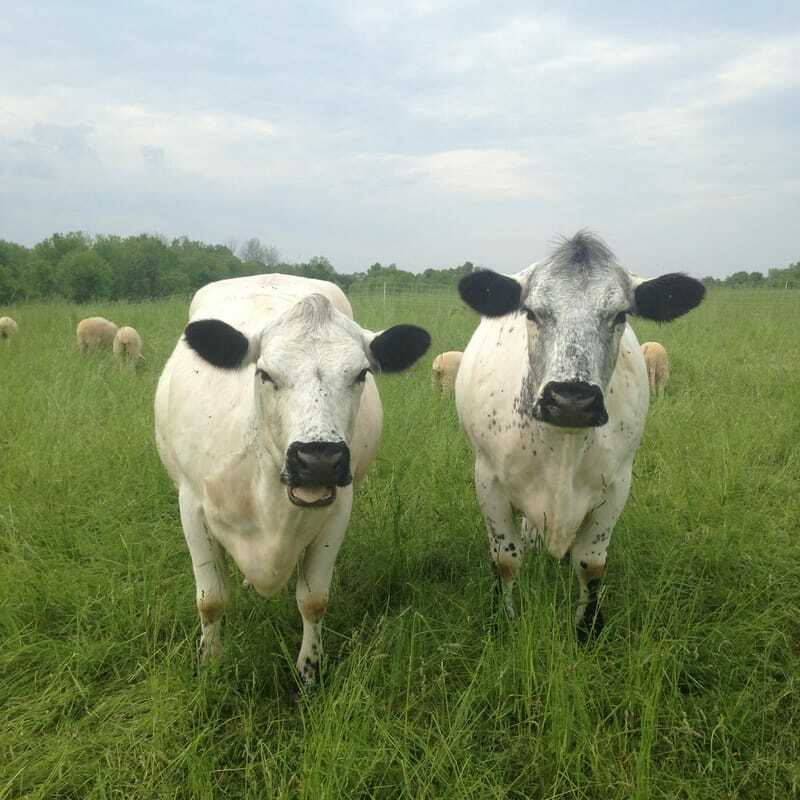 Maybe there would be more wholesale buyers for local meat, maybe there would be some kind of marketing cooperative to join, maybe people would just be more ready to pay higher prices for pasture-raised meat. It was hard to admit what I could and could not change. Maitri Farm is buying all of my equipment and remaining inventory. They do not currently have a livestock program and are interested in giving me a lot of freedom to structure the operation. Having the experience of running my own business with a limited budget was a huge part of getting this job. There is an existing veggie operation on site that I am excited to collaborate with. My immediate plans are look very similar to what I have been doing with sheep and pigs, but with a lot of the pressure taken off. I will be able to rotate weekend chores with the veggie crew and the financial risk will not be mine. 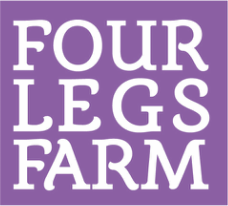 I am keeping the Four Legs Farm brand and intend to do side projects under that name. Stay tuned for fun meat and animal related endeavors! During my first year at Maitri I will keep my Four Legs list updated about how they can buy meat from Maitri. I learned more about farming and business from running Four Legs Farm than I could have working for someone else. I am grateful to have had the opportunity to pursue my own farm business. I am grateful to move forward in my farming career with more support. There are so many obstacles that keep people from pursuing careers in agriculture. The National Young Farmers Coalition is conducting a survey to better understand what young farmers need to be successful. If you're farmer, please take it. This impacts what work NYFC does in the next farm bill and beyond. Make your needs known! In the last month I shipped to two groups of pigs to be processed at the slaughterhouse. The couple with a trailer that I hired to help me have been super stars and I'm very thankful I found them. Getting pigs on a trailer when they don't want to go is rough. It's one of the most nerve-racking tasks on the farm. The first group took us about 5 hours of cajoling, nudging, strategic placement of food and creative use of pallets. The pigs weigh more than 300 lbs at this point - picking them up and throwing them into the trailer is not an option. It was the first time I tried to load pigs in this location. I built a little chute for the pigs to guide them from the pen to the trailer, but there were major design flaws to be worked out. It was difficult to gauge how exactly the trailer would sit in that spot before the day of. It turns out the trailer was pretty high off the ground and the pigs required two steps to get themselves up there. 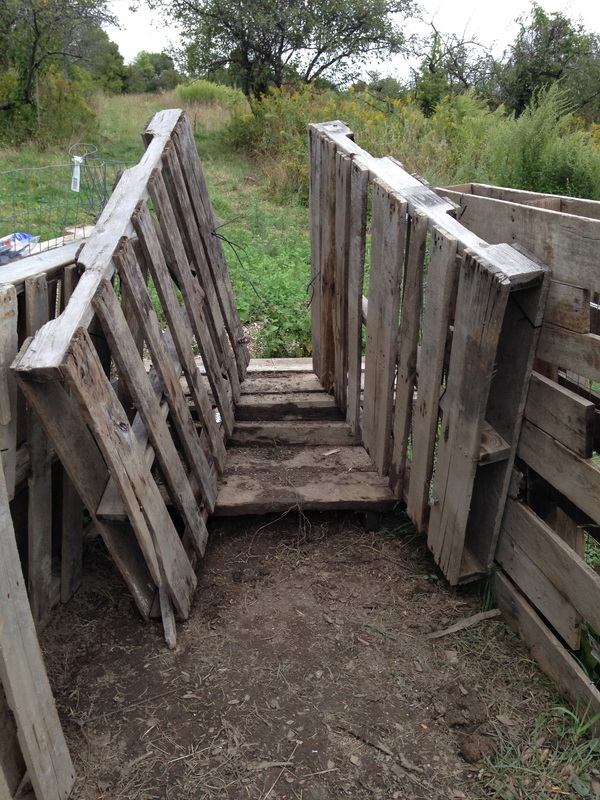 I cobbled together steps from pieces of an old goat milking set up leftover from previous farmers on the property. Another key piece was making the entrance to the trailer a funnel that the pigs could not turn around in. If the only way out is forward the trailer becomes a much more desirable destination for the pigs. We figured out how to lash the pallets together with zip ties to make rigid walls for the funnel and use pallets with two humans behind them to make it impossible for the pig to turn around. The second batch of pigs went much smoother and it only took us 2.5 hours to load them. The night before the pigs had to go I was nauseous with anxiety. It was such a relief; It felt like a huge win to have made a system work so much better. Farming is all logistics. The flerd (flock and herd) needs to get separated into two groups, boys and girls, ideally before the summer solstice. I keep my boys intact i.e. they get to keep all of their parts. It helps them grow faster, but it also means they shouldn't be kept with the girls to prevent any hanky panky. ​When the days start getting shorter after June 20th that signals the sheep that it is time for hanky panky and I am trying to avoid very young ewes from getting bred when they're too little and I have no intention of having baby lambs this winter. This is what the fencing looks like. The batteries in one of the energizers won't hold a charge anymore because I accidentally let them freeze. It took trying three different chargers, calling the manufacturer and reading the manual to figure it all out. New batteries are on their way. 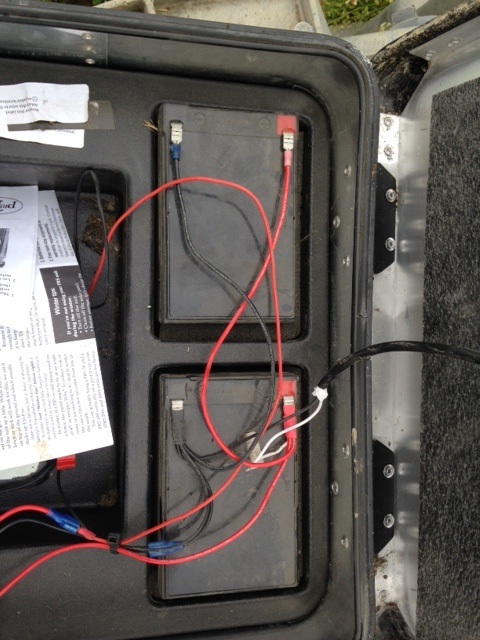 The fence charger looks like a metal suitcase with solar panels on the outside and big batteries on the inside. The water trough moves every three days with the flerd when they move to new grass. 3. I'm also building the water system as I'm grazing. There's the main line that runs along the top of the hill and I need to put in junctions so that the hose can plug in at different points along the line. I ended up buying the some wrong fittings and had to reorder the right ones. But now I have all the parts I need so that I can have water access at two different points in the pasture. As soon as the batteries arrive we will be in business for separating the boys and girls!